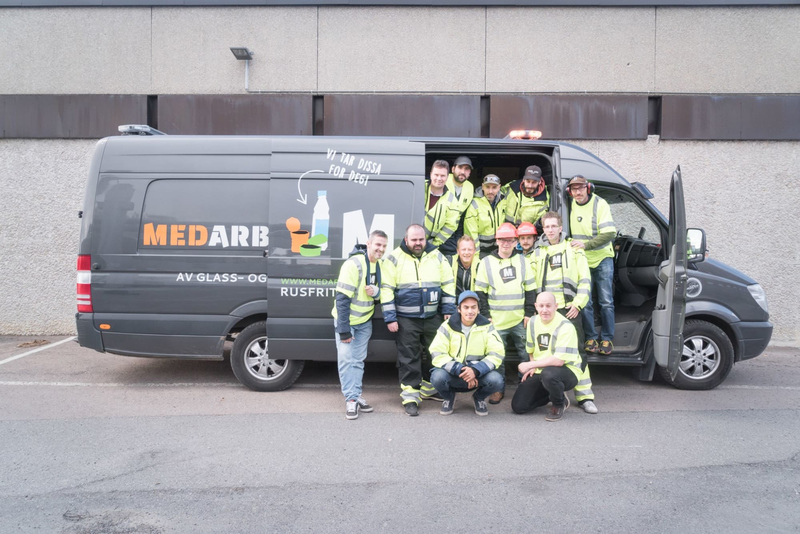 Medarbeiderne is a small company employing only people with a former history of drugs or alcohol. The workers are hired on normal contracts with ordinary salary. We believe that trusting people builds loyalty and that the positive effect of actually giving people a contract so they can perform as workers and generate value is better than receiving government compensation for work training. We believe many people that are able to sustain a job position are in work training for way to long time. In Norway, most municipalities only pick up certain types of waste from households. Therefore, certain types of waste are not being effectively recycled. We offer a subscription to private households and companies for picking up and removing small electrical waste materials, glass containers and metal packaging on a regular basis. A sales team visits 100-200 households every week to tell them about our simple recycling service with monthly pickup of glass, metal, bottles, electronic waste and old clothes. The subscribers than receive an SMS the day before pickup and put the waste on their doorstep. Everything is brought to recycling by workers who quit drugs and want to work instead. According to Norwegian Institute of Public Health (FHI), Norway has about 7 000–10 000 intravenous drug users. The figure remains stable. Each year hundreds of people take the difficult leap from drug abuse to sobriety, and many of them want to establish a normal life. Having a job is an important part of this goal. But, these people often face a system that does not give them any real chance to re-establish themselves in society. The goal of our business is to create ordinary employment for people who have a history with drugs. In the long term, we also want to cure prejudices and show other employers that an impeccable CV does not necessarily ensure that the right person gets the job. To quit using drugs requires a lot. People who successfully have put their drug abuse in the past possess resources that we want to emphasize. By trusting people with a history of drug abuse and giving them responsibility they grow confidence and experience the benefit of loyal and talented employees who want to help the company succeed. We also offer our customers a convenient service, while they get to support a good cause at the same time. In addition to the recycling service we are building a relocation service.